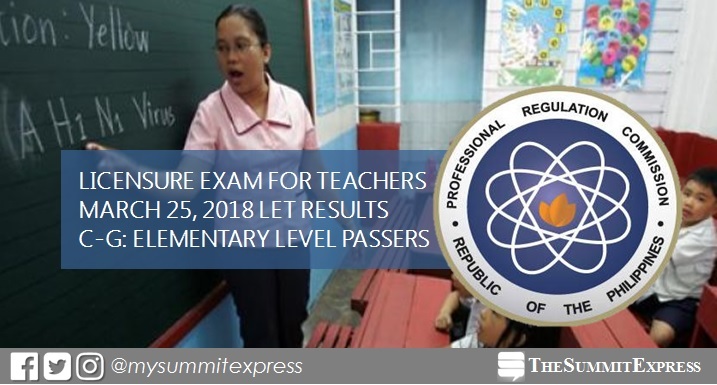 MANILA, Philippines – The results of March 25, 2018 licensure exam for teachers (LET), which include the complete list of passers, is available online as released by the Professional Regulation Commission (PRC) on May 23 or forty (40) working days after the exam. PRC administered the first LET of the year to more than 100,000 examinees in at least 20 testing centers nationwide: Manila, Bacolod, Baguio, Cagayan De Oro, Catarman, Cebu, Davao, General Santos, Iloilo, Kidapawan, Legazpi, Lucena, Occidental Mindoro, Pagadian, Palawan, Romblon, Rosales, Tacloban, Tuguegarao and Zamboanga. Takers may view on this page the alphabetical roll of passers for Elementary level - C to G surnames. Based on PRC Resolution No. 2017-1068, the target release date of March 2018 LET board exam results is on Tuesday, May 22, 2018 or in 37 working days after the exam.